Do You Know What LED Stands For? LEDs are everywhere; there's even a good chance that you're reading this article about LEDs by the light emitted from one or more LEDs. So, what the heck is an LED anyway? You're about to find out. LED stands for Light-Emitting Diode, an electronic device made up of two different types of semiconductor material. Similar in concept to the semiconductor material used in various computer components, such as RAM, processors, and transistors, diodes are devices that allow the flow of electricity to occur in only one direction. An LED does the same thing: It blocks the flow of electricity in one direction while letting it move freely in the other. When electricity in the form of electrons travels across the junction between the two types of semiconductor material, energy is given up in the form of light. The credit for the first instance of an LED belongs to Oleg Losev, a Russian inventor who demonstrated an LED in 1927. It took almost four decades before the invention was put to a practical use, however. LEDs first started appearing in commercial applications in 1962, when Texas Instruments made available an LED that gave off light in the infrared spectrum. These initial LEDs were used primarily in remote control devices, such as early television remotes. The first visible light LED also made its appearance in 1962, emitting a somewhat feeble but visible red light. Another decade would pass before the brightness would be substantially increased, and additional colors, primarily yellow and a red-orange, were made available. 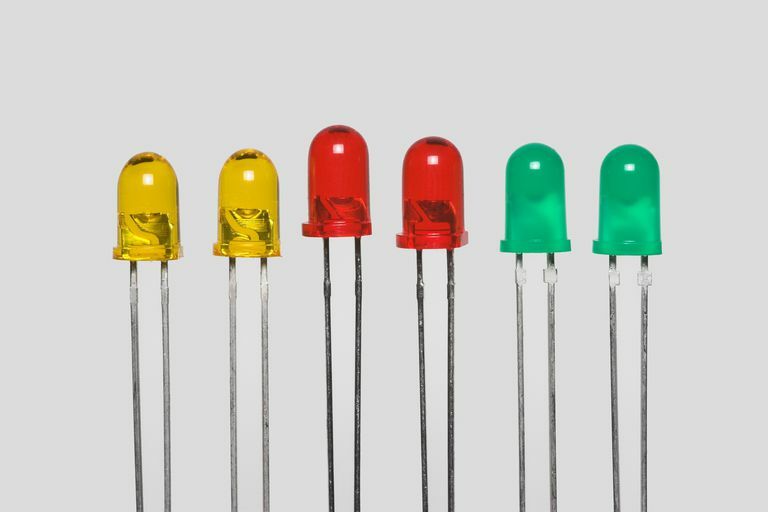 LEDs took off in 1976 with the introduction of high-brightness and high-efficiency models that could be used in a wide variety of applications, including communications and as indicators in instrumentation. Eventually, LEDs were used in calculators as numeric displays. LEDs in the late 70s and early 80s were limited to only a few colors; red, yellow, red-orange, and green were the prominent colors available. While it was possible in the lab to produce LEDs with different colors, the cost of production kept additions to the LED color spectrum from being mass-produced. It was thought that an LED producing light in the blue spectrum would allow LEDs to be used in full-color displays. The search was on for a commercially viable blue LED, which, when combined with existing red and yellow LEDs, could produce a wide spectrum of colors. The first high-brightness blue LED made its debut in 1994. High-power and high-efficiency blue LEDs appeared a few years later. But the idea of using LEDs for a full spectrum display never got too far until the invention of the white LED, which occurred shortly after high-efficiency blue LEDs appeared. Although you may see the term LED TV or LED monitor, most of these types of displays use an LCD (Liquid Crystal Display) for the actual display component and use LEDs to illuminate the LCDs. That's not to say true LED-based displays aren't available in monitors and TVs using OLED (Organic LED) technology; they just tend to be pricey and difficult to manufacture at large scales. But as the manufacturing process continues to mature, so does LED lighting. Infrared LEDs used for controlling appliances. Check that TV remote; chances are there's an infrared LED at the business end of the remote. LEDs are used as indicator lights in appliances and instrumentation. At one time, neon and incandescent lights were commonly used. Now LEDs, which are more efficient, have a long life, and are generally less expensive, have taken over this use. LEDs are used in displays, including alphanumeric displays seen in everything from early calculators to clocks, advertising signs, and transportation displays. And don’t forget that it's likely your TV and computer monitor are using LEDs to illuminate the display. And of course, we can't forget illumination; LEDs are well on their way to completely replacing the incandescent light bulbs perfected by Thomas Edison. Along the way, fluorescents in homes and commercial venues are also seeing less and less use. LEDs will continue to be used in a wide variety of products, and new uses are being rolled out all the time. What's Better: LED or LCD TVs? Do You Know Your Texting Abbreviations and Web Jargon? What is a Laser Video Projector?